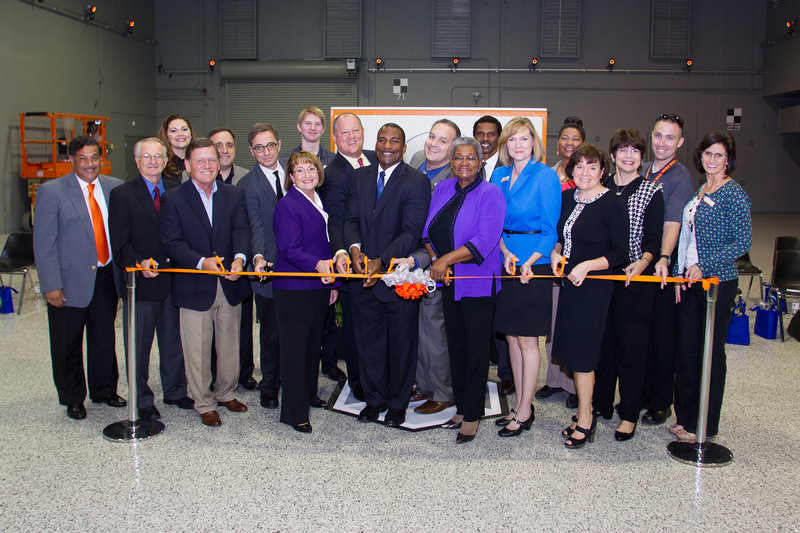 Mayor Teresa Jacobs recently joined community leaders at the ribbon cutting ceremony of Orange County Public Schools’ new Tech Centers Launch Site – Modeling and Simulation Training Center. Mayor Jacobs provided the opening remarks at the event and reiterated her support for the state’s multi-billion dollar modeling, simulation and training (MS&T) industry. The MS&T sector contributes more than $4.8 billion to Florida’s gross state product and directly employs more than 27,000 Floridians with an average annual salary of almost $70,000. At the new Launch Site, adults and dual enrolled high school students will learn specialized and highly valued skills that are critical for businesses in the MS&T and commercial simulation sectors. Additionally, the OCPS Tech Centers offer career certificate training in more than 40 career fields at an affordable rate to provide a hands-on and project-based learning experience. OCPS Tech Centers’ Senior Administrator for Marketing in Career and Technical Education Parker Antoine highlighted the importance of the Centers in Orange County. “Tech centers are helping fill a skills gap here in Central Florida and the U.S. in some of the most pressing career fields — such as manufacturing, building trades, modeling and simulation, information technology and networking, hospitality and tourism and health sciences,” Antoine said. OCPS Tech Centers was the host sponsor for the Florida Simulation Summit, an event presented by Mayor Jacobs in September that highlighted the simulation industry and identified opportunities for local businesses to commercialize simulation. The use of simulation in defense and aerospace has developed an impressive economic engine in Central Florida. The Central Florida Research Park, located next to the University of Central Florida, is the epicenter of the MS&T industry and fosters collaboration, cooperation and partnership between academia, industry and government. To protect this valued economic cluster, Orange County Government responded to looming threats posed by potential defense spending cuts and base closures by forming the MS&T Blue Ribbon Commission in 2013. The Commission is a coalition of community leaders and industry stakeholders that advocates for this high-value and high-wage economic sector in Florida. Many lawmakers have contributed to supporting this high-value, high-wage industry including Gov. Rick Scott, Florida House Speaker Steve Crisafulli and Senate President Andy Gardiner. Gardiner recognized the impact of the MS&T industry and helped garner the approval of $28 million dollars over the last two legislative sessions, which will allow the region to provide rent-free office space for local military commands. To view more photos from the event, please visit Mayor Jacobs’ Flickr page.